And they pitched a convincing argument at the event – the university’s first teaching and learning conference – hosted by the Centre for Higher Education Development (CHED) and the Institutional Planning Department. Over the day, delegates presented the work that they were doing to boost the effectiveness of teaching, speaking on the use of video-taping to teach communication, teaching and learning in large classes, facilitating small-group learning and multiple-choice testing in maths, among other topics. 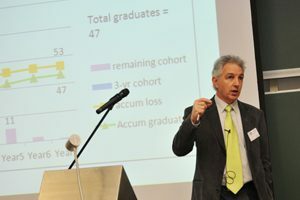 As vice-chancellor Dr Max Price emphasised in his speech, improved teaching may be the key to turning around the poor throughput rates of some programmes – such as the Bachelor of Science degree, which currently manages a cohort completion rate of under 50%. “We have a problem,” Price said. But already the university is beginning to put its money and resources where its ambitions are, he reported. This includes strengthening the emphasis on teaching in academics’ performance reviews, and the appointment of teaching-only academics to permanent posts – with promotion opportunities. There’s also a change in climate and a greater appreciation of teaching around campus, remarked Associate Professor Nan Yeld, dean of CHED and, for now, acting deputy vice-chancellor. For example, faculties are beginning to accept that strong faculty-specific structures are essential to bolster teaching and learning, she said. In addition, many are warming to the argument that perhaps the standard three-year degree is no longer a fit with the needs of the country and its less-prepared students. “Faculties are realising that, given our schooling system, you can’t actually produce a quality outcome without addressing some fundamental learning needs, and that you really can’t do that in the current envelope of a three-year degree,” she said. Teaching and learning could also play a part in UCT’s size and shape aspirations. Price and Yeld outlined how the university would be able to increase its graduate output and grow its undergraduate student numbers without simply hiking its first-year intake. Rather, they explained, UCT could increase the number graduating by up to 20% by improving its throughput rates, ie by keeping more students in the system. A steady increase in postgraduates was also envisaged. Professor Ian Scott, director of the Academic Development Programme in CHED, also had a word of caution for those who argue that throughput rates can be improved by simply pushing up admissions criteria. UCT is working with the cream of the country’s school leavers, both black and white, he pointed out.